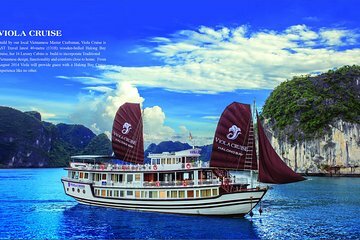 Plan a cruising adventure amidst the stunning limestone ‘karsts’ of Vietnam’s UNESCO-listed Halong Bay during this 3-day, 2-night, boat excursion. Enjoy free on-board Wi-Fi and included seafood dinners while participating in a range of activities including kayaking, swimming, cooking demonstrations, visits to local floating villages, and much more. Tuan was by far the best tour guide we've had in Vietnam. He was incredibly friendly, personable and even hung out with us in the evenings when we were playing games and chilling on the boat. It was unfortunate that the ban on kayaking had been enforced already, which meant the 2nd day's itinerary changed and we instead spent a long time on a day boat only to see one cave. I would warn everyone going to that cave to spray up with mosquito repellent - as the sand flies got us all so badly! I had sprayed, but clearly I forgot to top up or the spray needed to be stronger! Food on the boat is incredible, every meal is an extravagant feast and they are extremely accommodating with those who have dietary requirements too. Thoroughly enjoyed and obviously the bay was beautiful! Marvelous tour, very well organized, very nice place for sightseeing. I recommend this tour for everyone visiting Hanoi.